In 1840 a small Jewish family emigrated from Posen, Prussia settling in Kingston Upon Hull. 100 years later Mira Bibbero Johnson was one of the most famous actresses in England carrying on the family tradition of generosity in Yorkshire’s caring city. 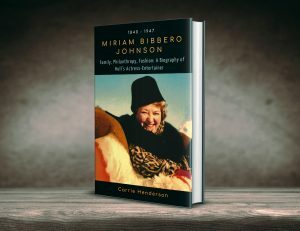 Introducing swimmer Professor Marcus Bibbero and grandfather Barnett, Mira Johnson’s biography charts her electrifying career. From the Wireless Age to BBC Television, Vaudeville, Variety and her West End Studio stage school Mira’s biography takes you from Victorian Britain to her work in the Voluntary Entertainment Service up to the end of World War II. Owner of Hull’s exclusive fashion house the House of Mirelle her story is truly fashionable, a stylish glimpse into clothes and society from days gone by. Illustrated with original artwork and told against a backdrop of theater, radio and film it’s an 100 year romp with all the twists and turns you’d expect from Hull’s charitable, characterful and creative pioneer. Look through our gallery and spot some of the locations in the book! Profits from the sale of this book will help preserve Mira Johnson’s legacy and that of her fashion house, the House of Mirelle. 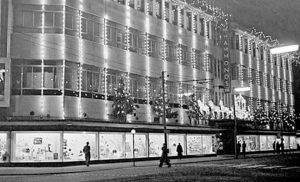 Hammonds department store twinkles with Christmas lights, Hull. c. 1930s. Cold December air ushered guests towards Powolny’s restaurant, flagpoles jutting across King Edward Street as they rounded from Victoria Square. Clutching tickets people walked the hallways to find hostess Mira Mountain illuminated at a dining room entrance, tables and white napkins, tea cups and layers of cake stands displaying food for Hull’s discerning guests. ‘Welcome’ she said generously to each of the 130, giving them a greeting name by name. Sliding gloves onto tables gentlemen positioned ladies’ chairs, rooms alive with chatter, cabaret dancers dipping in time with jazz and swing. Waitresses in black uniform took care with orders and in soft moments women shimmered, clasped around bare backs by their men’s hands. Voices poured from the restaurant chiming with icy midnight hours of Christmas, winter’s season approaching its end, 1936 on its way. 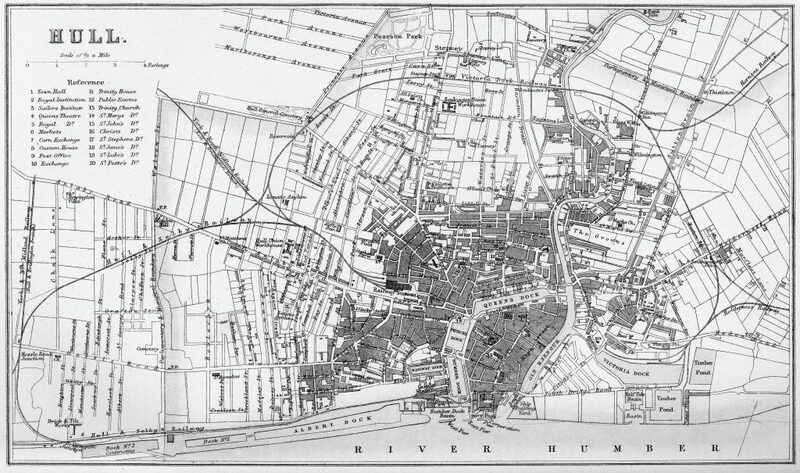 Vintage map from 1880 of Hull in the East Riding of Yorkshire, England. The city of Hull has served as market town, military supply port, trading hub, fishing and whaling centre, as well as an industrial metropolis. Two are at Hull History Centre, one in the local studies library where members of the public can borrow a copy. One is also held in the History Centre reference Searchroom. Other copies can be borrowed at Central Library, Avenues, Fred Moore (Derringham), Brandsholme and Ings. MY Library IS not on the list..
You can reserve a copy at your local library through an inter-library loan at a cost of 70p. Outside Hull, The British Library based in London and Boston Spa, Yorkshire can also make a request for an inter-library loan. ©2018 Carrie Henderson. All Rights Reserved.